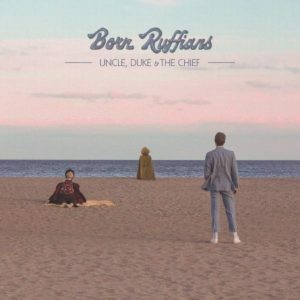 Toronto’s Born Ruffians are back with their 5th studio album, Uncle, Duke, & The Chief; their first with the original trio since 2013’s Birthmarks, which was my first introduction to the band. Creating a nostalgic rock sound soaked in reverb, the beginning track Forget Me was inspired by the passing of David Bowie, making the idea of death not a fearful one. Singer/writer Luke Lalonde is quoted as saying “We’re all doing this together, we’re all on the same path. Just some of us are ahead of others.” Even though this song is about mortality, I think it can also be applied to life and how sometimes we’re not meant to be on the same path as our partners and sometimes you have to take a different journey and let them go on without you. Maybe you’ll meet up again down the road. Maybe not. This idea fits in with the theme of the record which could be described perhaps as turbulent times. Forget Me, along with Love Too Soon, are the first tracks released off the album and are accompanied by music videos directed by Leah Fay Goldstein and Peter Dreimanis of July Talk. The bitter lyrics of Love Too Soon are masked by the smooth sounds of dreamy guitar, a simple bass line, and organ in the background. It’s the subtle whistling between verses that really sets this track apart from what could be considered just another “indie rock” song, given the ingredients. There are faster tempo tracks like the anthemic chorused Miss You and the punkier riffed Fade To Black. Side Tracked, Spread So Thin, and the album closer Working Together are the type of songs that will have you head swaying the whole time. Ring That Bell, along with Forget Me really nail the 60’s rock spirit, and basically this record is the first time I’ve been excited about a new record in a while. Slightly straying from their previous albums’ (RUFF) sound, I think this time they made a record that they wanted to make instead of what the critics wanted to hear. They say it best in the lyrics of Tricky, “I’m so sick of that overrated, stuff that you think is sophisticated”. Uncle, Duke, & The Chief is released February 16, 2018 via Paper Bag Records.